Enlil-nādin-apli, "Enlil (is) giver of an heir," ca. 1103–1100 BC, was the 5th king of the 2nd dynasty of Isin, and the 4th dynasty of Babylon. He was the son and successor of Nabu-kudurri-usur[i 2] and was toppled by a revolt led by his uncle, Marduk-nādin-aḫḫē. 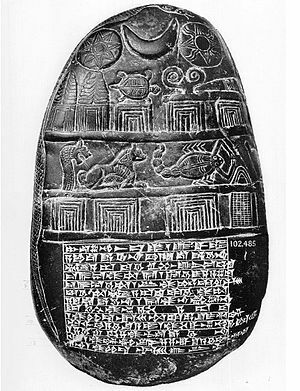 Black limestone kudurru of the time of Enlil-nādin-apli,[i 3] in the University Museum, Philadelphia. There are few contemporary artifacts attesting to his brief rule. A Lorestān bronze dagger is inscribed with his name and title. A kudurru[i 3] records the outcome of an inquiry instigated by the king in his 4th year into the ownership of a plot of land claimed by a temple estate. Ekarra-eqisha and Eanna-šuma-iddina, the governors of Bit-Sin-magir and Sealand respectively, were charged with the investigation which upheld a claim based on the actions of an earlier king Gulkišar who had “drawn for Nanse, his divine mistress, a land boundary.” It contains perhaps the earliest example of a Distanzangaben statement recording that 696 years had elapsed between Nabû-kudurrī-uṣur, his father, and Gulkišar, the 6th king of the 1st Dynasty of the Sealand, a contemporary of Samsu-ditāna. 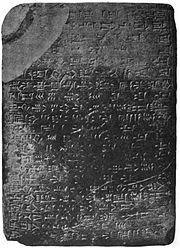 — Kudurru of Gula-eresh, Column 2 lines 23 to 25, column 3 lines 1 to 5. ↑ 1.0 1.1 Dark limestone kudurru BM 102485. ↑ King List C, 5. ↑ 3.0 3.1 Kudurru CBM 13, published as BE I/1 83. ↑ Walker Chronicle, BM 27796, 19-21 (reconstructed). ↑ J. A. Brinkman (1968). A political history of post-Kassite Babylonia, 1158-722 B.C. Analecta Orientalia. p. 118. ↑ L. W. King (1912). Babylonian boundary-stones and memorial tablets in the British Museum. London: British Museum. p. 78. ↑ C.B.F. Walker (May 1982). "Babylonian Chronicle 25: A Chronicle of the Kassite and Isin II Dynasties". In G. van Driel. Assyriological Studies presented to F. R. Kraus on the occasion of his 70th birthday. Netherlands Institute for the Near East. p. 402.